Electronics-Salon DIN Rail Mount Screw Terminal Block Adapter Module, For Raspberry Pi 1 Model B+ / Pi 2 Model B / Pi 3 Model B / Pi 1 Model A+. DIN Rail Mount Screw Terminal Block Adapter Module, For Raspberry Pi 1 Model B+ / Pi 2 Model B / Pi 3 Model B / Pi 1 Model A+. 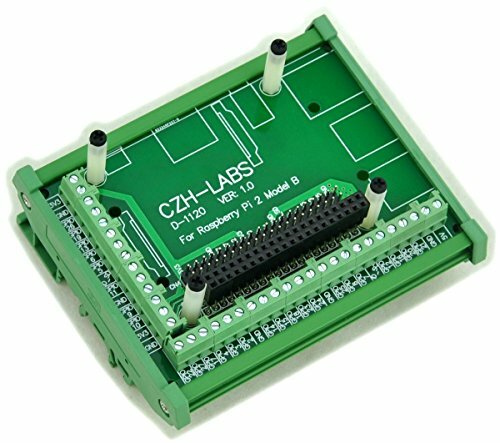 With the adapter module, you can easily extend Raspberry-Pi projects to industrial control applications. PCB Dimensions: 100mm x 72.5mm(W x L). Module Dimensions: 103mm x 87mm x 60mm (W x L x H). Note: the item not include Raspberry-Pi module and iron rail. Pitch 3.81mm/0.15" screw terminal block, wire range 26-16AWG, strip length 5mm, Metric M2 slotted screw. PCB Dimensions: 100mm x 72.5mm(W x L), FR-4 fiber glass PCB, dual copper layers. Electronics-Salon DB25 D-SUB DIN Rail Mount Interface Module, Male / Female, DSUB Breakout Board. Electronics-Salon D-SUB DB25 Male / Female Header Breakout Board, DSUB Terminal Block, Connector. Electronics-Salon 24/20-pin ATX DC Power Supply Breakout Board Module.